This article is about the microgame. For the full-length minigame, see Sheriff (minigame). For the Assist Trophy from Super Smash Bros. for Nintendo 3DS / Wii U, see Sheriff (character). Info "Take out the bad guys and avoid their cross fire. How's this for memory lane?" 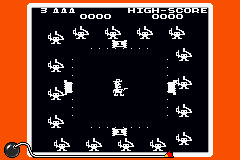 Sheriff is a microgame found in the Nintendo Classics folder in WarioWare, Inc.: Mega Microgame$!, based on Nintendo's arcade game of the same name. The Sheriff must shoot down the group of bandits circling on the outside while avoiding their shots. Level 1: The player must shoot one bandit. Level 2: The player must shoot two bandits. Level 3: The player must shoot two bandits; this group moves faster, and some will quickly move toward the center to shoot the Sheriff. This page was last edited on September 19, 2018, at 17:07.